HD 1080P Sony Dome CCTV Security Varifocal Coax Camera Dual Voltage Infrared Indoor/Outdoor Color D/N | Armor Color Cameras | iHDIRVFVDFIO-1080SN | | iLink Professionals, Inc. 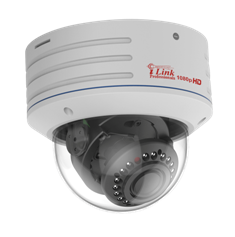 The iHDIRVFVDFIO-1080SN is a dual voltage vari-focal dome Sony HD 1080p infrared surveillance camera that supports AHD and standard analog (CVBS). The 2.8mm to 12mm vari-focal lens are adjusted with the twist-rings on the camera and that allows the owner to adjust the field of view to a much more zoomed angle. The iHDIRVFVDFIO-1080SN has 18 built-in infrared LED's that enables the camera to see in the dark up to 60 feet.